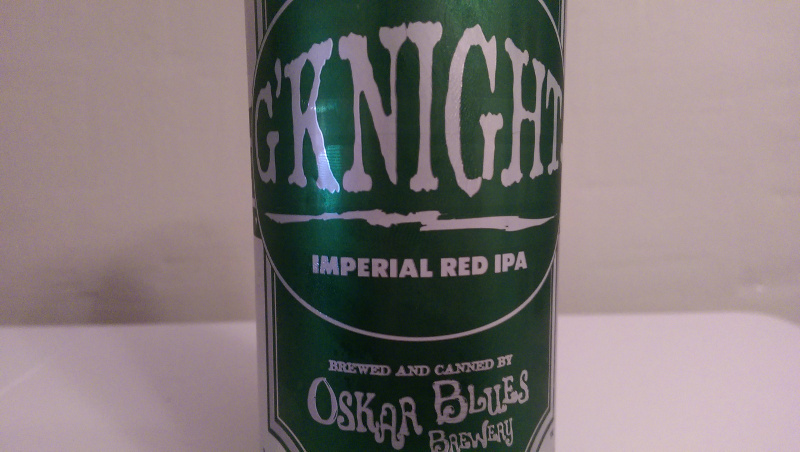 Beer Profile: Oskar Blues G’Knight Imperial Red IPA – Food. Beer. Stuff. Oskar Blues Brewery is quickly becoming one of my favorite craft brewers. Having only been available in Delaware liquor stores for a short time, I find myself becoming jealous of other locales that have had the good fortune of enjoying their offerings since 1998. Since first finding them on shelves I have been able to try out Dale’s Pale Ale, Old Chub Scotch Ale, Mama’s Little Yella Pils and finally last night, G’Knight Imperial Red IPA. 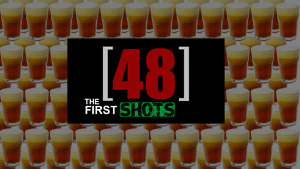 If you have been reading this blog regularly (or clicked on any of those links), you will know that I have had nothing but great things to say about them all. Although I managed to go through all 4 of the pints I had on hand last night, I still found a way to get up early and help open my local liquor store this morning to pick up a few more 4 packs so that I could do a proper Beer Profile for you today. Maybe I also just needed a bit of the hair from the dog that bit me. G’Knight Imperial Red IPA is a tribute beer, named after craft brew pioneer, Gordon Knight, it is in his honor that Oskar Blues founder Dale Katechis created this dry hopped can’o’bliss. If you have not visited www.N3978Y.com to read about Gordon Knight you may want to take the opportunity to do so now. It is stories such as his that have permeated the craft beer movement in the USA and truly it is stories like his that make craft beer so special to so many people and one of the things I love about craft beer the most. Like all of Oskar Blues Beers, G’Knight comes in an attractively styled can, proving that it is not what a beer is packaged in but the brewer that matters. From the first second I open the can, G’Knight Imperial Red IPA is a pleasure to the nose with thick citrus aromas wafting through the air. 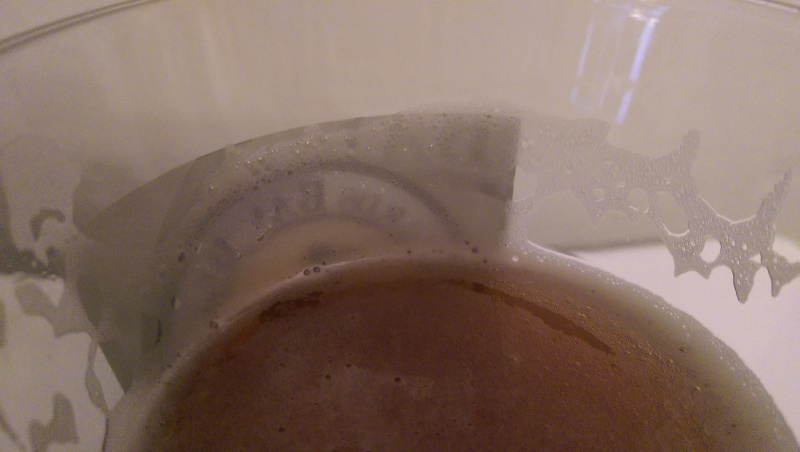 This is magnified with the pour which I find leaves an easy, one inch head. In the glass this IPA is a brilliant red amber, alluding to the presence of sweet caramel malts, something I don’t necessarily seek out but I wasn’t exactly surprised to find as this is clearly labeled “Red IPA”. Pours out amber red with a nice bit of head. On first taste, I am happy to find this beer is nowhere near as sweet as I was expecting. Lately my teeth have been hurting from all the malty sweetness in the last couple profiles so I find it to be a welcome change. In the glass I pick up on some more aromas, mostly some strong herbal notes which lend themselves nicely to the piney, slightly bitter finish. As I continue with G’Knight, I find myself impressed with just how smooth of a beer this is. Not just for a beer with such a high ABV but for a beer in general. If I didn’t know any better, I would never guess this to be an Imperial IPA and would assume the alcohol content was quite a bit lower. This beer has a great sticky mouth feel with a middle of the road, maybe a bit heavy for the style, body full of resininess, just hoppy enough goodness that begs me to keep drinking. On the Oskar Blues Website, G’Knight is described as “Our Velvet M-80” and I have no problem seeing why. This Imperial IPA is dangerously smooth and drinkable. I find the balance on this beer to be exceptional with the sweetness of the caramel malts muted perfectly by the large volume of bittering hops. As an IPA it is wonderful to drink, as an Imperial IPA it is downright killer. I’ll be damned Oskar Blues, you did it again, consider me you newest, biggest fanboy. 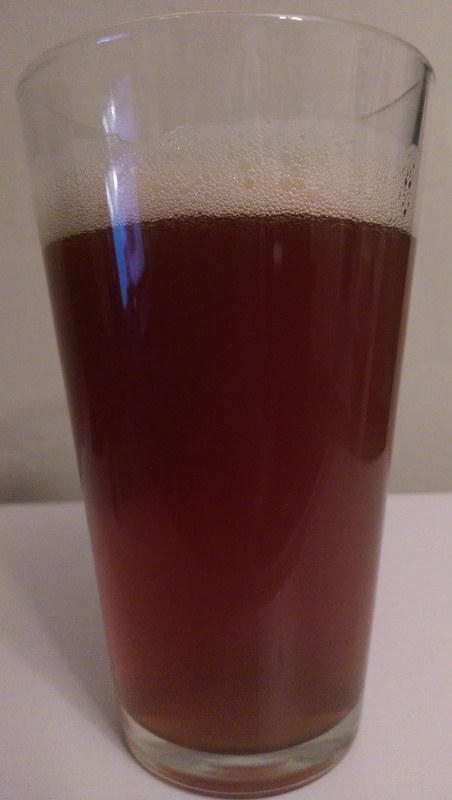 G’Knight Imperial Red IPA is the type of beer that makes you sad when your glass is empty. Lucky for us, it doesn’t have to stay empty for long, Prost! Have you tried Oskar Blues G’Knight Imperial Red IPA? What are your thoughts? Lets talk about it in the comments below. Great beer makes it easy, Thanks for the support!